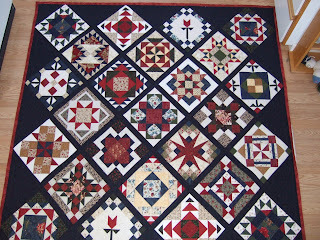 This is the fourth 2005 Block of the Month i have quilting for clients...and i'm expecting another one soon. It gets challenging trying to quilt them differently. It is hard to see in the picture but i did a feather design in the navy setting triangles and the blocks are custom with in the ditch, free-hand and stencil work.